Here’s another image sent me by Ted Cox, author of Murray Loop whose Owram and Murray ancestors were at Liberal. 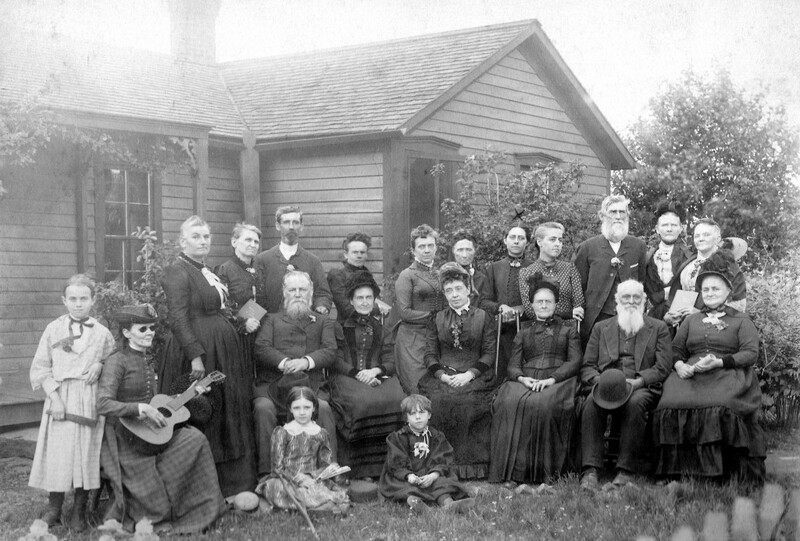 It’s identified as a Christian Science Class held in Liberal, Missouri, and the date is May 2, 1891. Minnie Owram, who was twenty-three, stands in the back row, fifth from the right. There are at least a couple of other individuals that can be identified as being also in the image of Harmony Hall that Ted Cox also sent. The man and woman seated on the far right–he has a long white beard and is holding a hat, and the woman is sitting on the end of the row–are the third and fourth individuals standing to the left in the Harmony Hall image. I think it’s possible there are several women seen in this image that are also in the photo of Harmony Hall, but I’m uncertain about them, whereas I’m certain about these two.